February is National Pet Dental Care month. Chew on this…did you know that 8 out of every 10 pets over the age of three suffers from gum (periodontal) disease? Proper prevention and dental treatment are necessary. Without proper preventative steps, your pets can suffer from tooth decay, bleeding gums, tooth loss, and even internal organ damage. 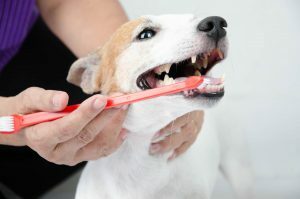 Pet dental care is an important part of pet ownership. Keep your pet healthy from tail to tooth! Get your pet on a regular dental care schedule starting this month! This entry was posted on Monday, January 28th, 2019 at 5:26 am	and is filed under Dog, News & Updates. You can follow any responses to this entry through the RSS 2.0 feed. Both comments and pings are currently closed.